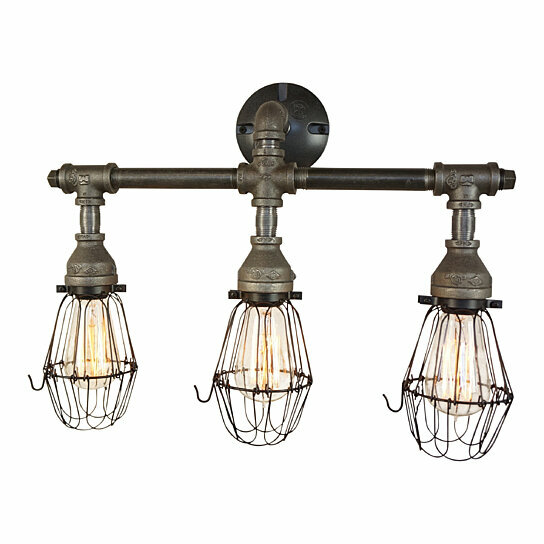 With its industrial charm and elongated wire cages, the Nelson Vanity Three-Light Fixture is a warm and inviting lighting solution. This 18 inch wide light is made of half-inch industrial iron and finished in a clear satin sealer. Urban and stylish, this light will be the perfect addition to any bathroom, warming up your vanity space with a flood of soft light. Our products are uniquely handmade. Any of our lights can be used with a wall dimmer to soften the glow and will work with the energy-saving bulbs (LED) or Incandescent (Edison Industrial) bulbs. All hardware is included for an easy install. Materials "Steel Pipe":Country of Origin "USA"